October Equus Quartet perform original compositions that bring together elements of contemporary chamber music and avant-garde jazz and rock. 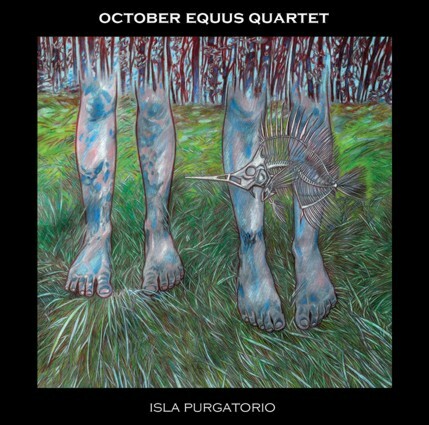 Commonly associated with the Rock In Opposition movement, October Equus Quartet bring to this album a raw sound without artifice in contrast with the intricate arrangements of guitarist Ángel Otalva’s compositions. Ángel Ontalva (guitar and composition) and Amanda Pazos Cosse (bass, production) collaborate in several projects and have been pushing the boundaries of creative music for more than ten years. With October Equus they spearheaded avant-rock in Spain and have released four studio albums. They also bring together world music and jazz rock in other projects such as Mundo Flotante, Transarabian Connection or Ofir. Together with them in October Equus Quartet are Vasco Trilla (drums) and Alfonso Muñoz (sax), key figures in the free jazz and avant-garde scene in Barcelona and members of Planeta Imaginario, Filthy Habits Ensemble or Reptilian Mambo, among others.